Looking for fun and interesting things to do in Europe that aren’t covered in typical travel guides? Check out these eight strange attractions during your next visit. Europe is a prime spot for any student. Typical tourist spots such as Westminster Abbey and the Eiffel Tower attract millions of visitors every year – but every traveler can speak to those wonders. For adventurers in search of a more unique trip, these eight experiences are a must. Every summer, the Rooftop Film Club hosts movie nights in London, England. At venues in Peckham, Shoreditch, Stratford and Kensington, you can watch one of your favorite movies while cuddled up under the stars; past films have varied from Breakfast at Tiffany’s to more recent films like Mad Max. The club provides seating, blankets and snacks that range from typical theater food like popcorn to themed cocktails and BBQ snacks. All you have to do is buy your tickets ahead of time at rooftopfilmclub.com – then kick back and enjoy your presentation. The Portuguese won’t let an inconsequential thing like a lack of snow stop them from participating in winter activities. Visitors to island of Madeira can hop aboard the Monte Toboggans, where they can slide down the streets of Carreiros do Monte at almost thirty miles an hour. Two attendants in wicker hats act as the brakes, putting down their rubber boots to slow down the sled as you fly down the black-topped roads. This tradition, which began in the mid-1800s, lasts ten minutes and is available for only €10 – if you’re in Portugal, make sure to add this exhilarating experience to your group’s to-do list. Yes, you still have to travel to Stratford-Upon-Avon to see the man himself – but literary fans will delight in Shakespeare and Company, a bookstore in Paris, France that hosts its own community among artists and writers. Originally opened by Sylvia Beach in 1919, this shop has been frequented by famous writers such as Hemingway, Fitzgerald and Ginsberg. The store’s normal activities include readings, lectures and discussions with authors, as well as literary festivals. However, to truly have a unique experience, you may consider becoming a Tumbleweed – a term given to those intellectuals who elect to stay and learn at the store. There are prerequisites for this opportunity; one must read one book a day, volunteer at the shop, and write a one-page autobiography. For more information on the store and life as a Tumbleweed, visit shakespeareandcompany.com. Do you love beer so much you wish you could swim in it? Make sure to travel to Starkenberger Brewery in Tarrenz, Austria where you dream can become a reality. Operating out of a castle, this brewery contains seven 13-foot beer pools, where visitors can relax and enjoy the health benefits – the beer is allegedly good for your skin. If you feel thirsty, have a nice cold beer on the house; attendants don’t recommend drinking straight from the pool. Make sure to book this experience ahead of time, though you may have to save up – reserving a pool for two hours costs $298. For those who want a less immersive trip, the castle also offers brewery tours. To learn more about all the brewery has to offer, check out www.starkenberger.at. Named after the Jimi Hendrix album, Electric Ladyland is not your typical museum. 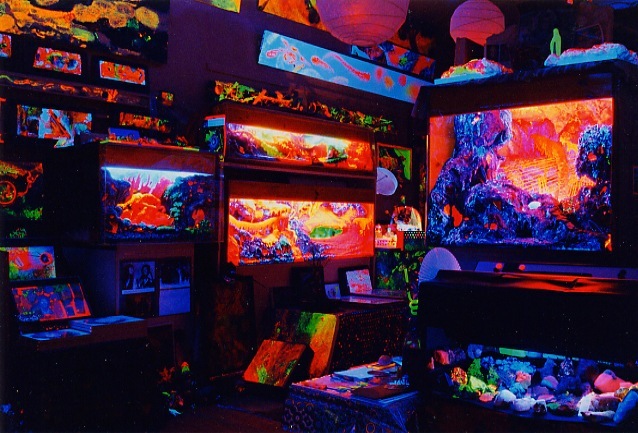 It’s known as the first museum of fluorescent art, where visitors can view fluorescent mineral artwork and see demonstrations where pale gray rocks are put under different light sources that make them change color. This Amsterdam spot, not far from the Anne Frank House, has been described as “walking through an acid trip,” and for good reason – the psychedelic ‘60s pale in comparison to the vibrant swirl of colors the museum offers. At just €5 a person, admission includes a 15-page booklet, and for added fun your group can visit the Electric Lady Art Gallery upstairs. Created as an alternative to London’s 2012 Olympics, this new tradition in Llanwrtyd, Wales almost makes the centuries-old Olympics seem dull. Held every two years, the summer event includes competitions such as bathtubbing, wife carrying, finger jousting and underwater hockey. The World Alternative Games of 2014 became Lonely Planet’s “Coolest Place to be in 2014” – and yes, you can join in when the games are held again in 2016. Gold, silver, and bronze medals are given to the top competitors, but if your rock-paper-scissors skills are not up to the challenge, participation medals are also awarded. To see classic plays in a new way, visit the Theatre Royal de Toone in Brussels, Belgium. The attraction offers puppet shows such as Romeo and Juliet and The Three Musketeers every Thursday, Friday and Saturday. During your visit, you may also check out the theater’s workshop, library, café and museum, which is the home of puppets from former productions as well as puppets from around the world. Each show lasts two hours and can be seen for €12, though discounts are offered to students. Make sure to brush up on your French, as most productions are conducted in the world’s most romantic language. For more information about the theatre and its plays, visit www.toone.be. Once a traveling exhibition, the Museum of Broken Relationships now has a home at Kulmer Palace in Zagreb, Croatia. The collection your group will encounter is unlike any you’ll find at another museum – all the artifacts are items that were significant to a couple’s break-up, and each carries a story to be read. Among the exhibits are a wedding dress and an “ex axe”, which the bearer used to chop up their former lover’s belongings after the abrupt end of their relationship. Open almost every day, the building now includes a café at the end of the museum so that visitors may collect themselves after the “emotional whirlwind” they experience. Interested parties can even sign up to be donors – just submit your story to www.brokenships.com. Know of any other strange things in Europe that must be on our bucket lists? Tell us in the comments below.